Living in the country everything moves - the seasons, the clouds, nothing is set. There are things all around you and you are in it. Everything is constantly moving.… You begin to realise that you are in a landscape that is really the crust of the earth. It is air and ground. We’re all just spinning through space. There is something about the painting that is indefinite, not solid. We don’t really have an orientation in this infinity. … You begin to question what time is. Time isn’t something that is just measured on a clock. Time can also be a mind thing - you can be a time-traveller with your mind in a painting. WESTERN art has had a long tradition of romantic landscape painting. In the 18th and 19th centuries, such Europeans as J M W Turner and Caspar David Friedrich and Americans, including Thomas Cole and George Caleb Bingham, produced grand idealised vistas of vast beautiful paradises on earth - endless plains, towering mountains, majestic seas, rivers and waterfalls. Man, if depicted at all in these immense panoramas, is but a small, lonely being, confronting the awesome grandeur and mystery of the universe. Contemporary society, perhaps weary of economic gloom, war reports, images of terror and waning social intimacy and security - and of the arid deconstructivist, theoretical discourses of much postmodern art in the 1980s and 90s - has responded to a new spirit of Romanticism in painting in the 2000s. In the works of contemporary painters such as Britain’s Peter Doig, landscape has again become sublime, and the lonely, yearning viewer again drawn into a quest for paradisiacal and transcendental experience. I n Australia, the chief and most original exponent of modern romantic landscape painting is William Robinson, born in Brisbane, Queensland, in 1936. He trained as an artist and teacher in the late 1950s and early 60s and was also an accomplished pianist, but decided painting rather than music would be his vocation. 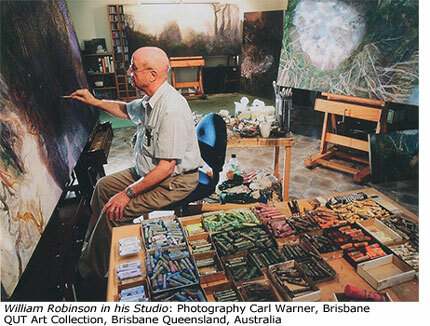 The current QUT Art Museum exhibition surveying his oeuvre in honour of his 75th birthday reveals that Robinson’s evolution as a painter has been long and slow. 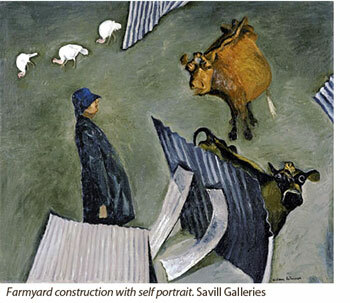 His early work in the 1970s - intimate, Bonnard-inspired Brisbane bedrooms and breakfast tables with women, flowers and dogs ; chaotic Birkdale (outside Brisbane) farm scenes with rickety corrugated iron structures replete with chickens, ducks, cows and goats - was a mixture of playfulness, humour and tenderness. In 1984, Robinson moved with his family to an 80-hectare farm on the Beechmont Range, near Canungra in Queensland’s Gold Coast hinterland. In the late 80s and 90s, his paintings retained the Bonnard-like quirky drawing, deft impressionist tapestry-like brushstrokes and luminous colour. He produced award-winning portraits, but his most profound work became an exploration of this high country of ancient volcanic ranges and thick rainforest and of the shoreline and sea a little further south. 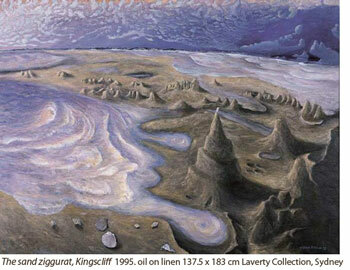 Pictures such as Creation Landscape: Man and the spheres 1991 (Art Gallery of New South Wales, Sydney) stand as a modern romantic image of primaeval wilderness. Freed from the tyrannies of perspective and lighting in its multiple, topsy-turvy viewpoints and shifts from day to night, it gives us a sense of mankind spinning through space and time, as the artist puts it, and give us a profound sense of religious feeling: joy mingled with sadness. 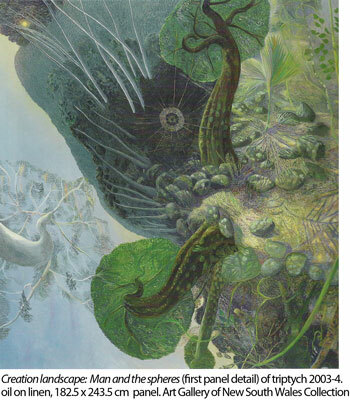 The Biblical note of this work, its evocation of eons of creation, elation and the magical conjuring of the paradisiacal, has become the chief characteristic of Robinson’s work from then on and has struck a strong answering chord in his audiences. William Robinson: The Transfigured Landscape is a large and immensely enjoyable exhibition, showing that Robinson has created a large body of paintings that are among the most inspiring evocations of Australian land, shore and sea ever produced. The exhibition is accompanied by a fine book, with half a dozen essays offering perspectives which, in the vein of Robinson’s own artistry, are varied, many-layered and insightful .